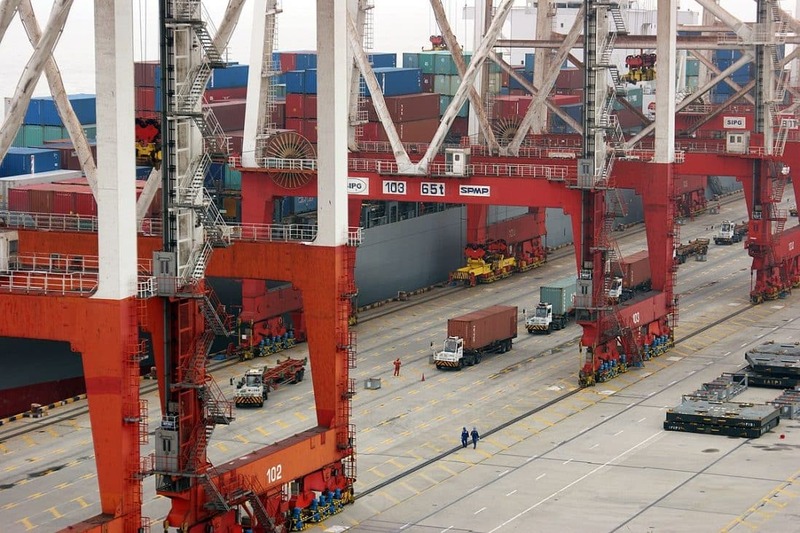 Containers being loaded onto a ship behind enormous crane gantrys at Yangshan deep water port (2013). Image credit: Bruno Corpet (Quoique), Wikimedia Commons, CC BY-SA 3.0. Zhiming Long is an assistant professor at the School of Marxism of Tsinghua University, Beijing, People’s Republic of China. Rémy Herrera is a researcher at the National Center of Scientific Research (CNS, UMR 8174, Centre d’Économie de la Sorbonne) in Paris, France. The success of the Chinese economy can be illustrated by the rapid growth rate of its Gross Domestic Product (GDP)—very probably the highest in the world, on average, over the last three decades—and its leadership among the countries of the global South today. While this success is often commented on in academic literature and the mainstream media, it continues to be shrouded in mystery, particularly because of the controversial, wide-ranging, and generally misunderstood debates between Chinese economists.1 Indeed, Western commentators are forced to rely on statistical databases and information sources developed by Western institutions (or multilateral ones, but dominated by Western powers). Ideological in nature, this Western-centric prism is distorting and often attributed to Chinese authorities. Other difficulties arise not only from the ambiguous terms and categories used to classify China, such as “emerging economy” or a “BRICS” state, but also from the indeterminacy and confusion in characterizing the current Chinese political and economic systems. These dynamics begin to explain how, outside of China, opinions on the changes in the country are often poorly documented and insufficiently substantiated. From the right, the apparent triumph of capitalism in China is celebrated, even if one considers its combination with the “communist dictatorship” as somewhat aberrant. From the left—or rather, among Marxists—the range of disagreements regarding China is immensely broad, going from disapproval of the glaring societal inequalities brought, in part, by the country’s economic dynamism, to hope for the establishment of a new superpower with the potential to thwart the hegemony of the United States. The dramatic rise of China intrigues and fascinates, causing both admiration and anxiety. Nevertheless, its economic growth remains an enigma for all. It is in this particularly vague context that a consensus seems to have been reached in dominant Western institutions that China’s rise can be explained through a series of clues. One of the most widespread forms of so-called evidence is that the Chinese economy “emerged,” and its growth “took off,” after the reforms of the late 1970s, specifically those implemented after Chairman Mao Zedong’s death in 1976. This article questions this consensus and attempts to unravel some of the “enigma” surrounding China’s economic growth without pretending to dispel all its complexities. One of the most ubiquitous ideas about China is that it has only “emerged” recently. In fact, the very concept of emergence—as well as of “BRICS,” forged by U.S. high-finance think tanks—suggests that a “takeoff” is possible in the current context of globalization despite the malfunctioning of the capitalist world system, which is so clearly unfavorable to the countries in the global South. Nevertheless, this idea, which argues that China’s economy emerged or took off, and can only have emerged or taken off, after the death of Mao, implicitly adheres to one of three lines of reasoning. First, the Chinese economy can only have truly begun to develop through its “reorientation” and “openness” to the capitalist world system, adopted under Deng Xiaoping following the Third Plenary Session of the Eleventh Central Committee of the Chinese Communist Party (CCP) in December 1978 and, incidentally, some weeks later, the diplomatic recognition of the People’s Republic by the United States in January 1979. Second, it is self-evident that the Chinese economy would have stagnated during the Maoist period, since that is the nature of socialist economies. Third, following the same reasoning as the two aforementioned arguments, China would have been able to modernize almost immediately (as if by magic) after the abandonment—if not the label—of “communism,” or at least the institutions of socialism by its political leadership, allowing the reorientation of the country toward a form of capitalism. Nevertheless, in doing so, three fundamental realities are simultaneously obscured. The first is the millennial depth of history. Indeed, China has indisputably “emerged” onto the world stage; however, it was not forty years ago, as repeated by the mainstream media’s absurd leitmotif, that China became a major civilization and nation-state, but several thousands of years ago. China’s economic weight was as high as a third of the world’s GDP in the early nineteenth century.2 Moreover, it was only the victory of the Maoist Revolution in October 1949 that made it possible to put an end to the century of wars that had torn apart the country since the First Opium War of 1839–42 and the assaults by Western powers. Second, when China’s GDP growth started regularly to exceed the 10 percent mark in the 1980s (compared to 3 percent in the United States), the core socialist structures and institutions were still in place. Third, while often forgotten, China’s GDP growth rate was relatively high before Mao’s death. According to data provided by the World Bank, expressed at constant prices (base 1980) and in ten-year averages, China’s economic growth rate was 6.8 percent between 1970 and 1979, i.e., more than double that of the United States during the same period (3.2 percent, also at 1980 constant prices).4 Furthermore, according to the official GDP series published by China’s National Bureau of Statistics (NBS) since its creation in 1952 up until today, the growth rate of China’s GDP averaged 8.3 percent annually from 1952 to 2015, with a strong 6.3 percent between 1952 and 1978 and an even stronger 9.9 percent between 1979 and 2015. These percentages are expressed at constant prices in base 1952 and standardized to take into account the statistical breaks that marked the accounting transition from the Material Product System (MPS) to the more “modern” System of National Accounts (SNA).5 Nevertheless, if we exclude the very first years of the People’s Republic from 1952 to 1962—i.e., between the completion of the unification of the continental territory and the period of the break with the Soviet Union—there is a recorded average of 8.2 percent per annum GDP growth rate in the period of 1963–78, reflecting very rapid growth even during the Cultural Revolution. What about capital accumulation in China? In an article published in the China Economic Review, we have managed to construct several original time series of physical capital stocks for China over the long period between 1952 and 2015, partly in order to be able to use this new database in other research and partly because China’s statistical institutes have not yet made official capital stock data public.6 There are various reasons for which our time series, calculated using a permanent inventory method, can be considered high quality compared to existing literature, including the Penn World Tables. For instance, initial stocks are estimated using a more rigorous calculation procedure for the capital-output ratio than those used for other databases; investment flows are strictly consistent with the statistical scope of the stocks; we focus on the construction of investment-price indices adapted to the exact content of these stocks; and the depreciation rates used are assessed by the type of capital asset in order to deduct a total depreciation rate from the overall capital structure. In fact, in this new database, the average growth rates of the capital stock that we called “productive” (including equipment, machinery, tools, industrial buildings, and facilities, but not residential buildings and their land value) showed very little difference over the two subperiods of 1952–78 and 1979–2015: 9.7 percent for the first subperiod and 10.9 percent for the second. If we retain a larger productive capital stock, including the inventories, which are important for calculating the rotation rate of circulating capital, we see that the average rhythm of accumulation of such a stock was slightly higher between 1952 and 1978 (10.41 percent) than between 1979 and 2015 (10.39 percent). Moreover, if we select an even larger capital stock to also include the constructed residential buildings and their land, not directly productive components, the growth rate of this very large capital stock continued to be high, averaging 9.1 percent from 1952 to 1978 compared to 10.9 percent from 1979 to 2015. It is, therefore, quite clear that the capital accumulation effort is not a recent phenomenon, but that it has been continuously decided and planned by the Chinese authorities over the past six decades. It is this sustained effort of accumulation, enabled in particular by surplus transfers from rural areas, that explains the success of industrialization and, to a large extent, the robust rate of GDP growth. We have thus proposed our own series of educational stocks for the population, endeavoring to provide some responses to these shortcomings. As examples, we have remained faithful to the NBS definition of the level of education achieved by the population, prompting us to include not only individuals with degrees, but also those who are still in school and even dropouts. We have also taken into account changes in the length of educational cycles based on successive educational reforms, as well as the impact of school campaigns and training programs for adults. Thus, we have determined various educational-resources stocks and their accretions, which requires calculating the average number of years of education of individuals by category of training and their respective weights in the population. It is observed from our estimates that China’s average growth rates of the total stock of educational resources were extremely close over the subperiod of 1949–78 (4.19 percent) and the subperiod of 1979–2015 (4.22 percent). In addition, if we consider a “productive” educational stock by performing calculations from the labor force (and not from the total population, as previously done), then the average growth rates of this stock of educational resources were 5.07 percent from 1949 to 1978 and 3.55 percent from 1979 to 2015—that is to say, higher preceding the 1978 reforms. Hence, investment in the educational sector must be analyzed as a long-term process that was important as soon as the People’s Republic was established, because it aimed to massify education and occurred parallel to the extension of infrastructure and the public health care system to the entire national territory. This is one of the central pillars of the revolution’s long-term strategy that has decisively contributed to the strength and dynamism of the current economy. Regarding research and development (R&D) expenditures, China only started to integrate the international accounting system for R&D activities in 1986. This obviously does not mean that the country has only invested in R&D since then, but it is impossible to access homogeneous databases on the subject from before 1986. Given such a constraint, we have developed an original time series for R&D spending flows, going back as far as 1949. We have retained all the budgets, both from economic private entities and public ones (such as research centers, universities, and state-owned enterprises), although, in total research budgets, the proportion of R&D originating from the private sector has so far remained relatively minor in China. It was only in 1984 that a local private enterprise was authorized to operate in the People’s Republic for the first time, and the first legislation relating to the activities of the various private economic entities dates back to 1988. According to official NBS directories, R&D expenditure of medium and large industrial enterprises amounted to less than 6.5 percent of total R&D expenditure in China in the mid–2000s. In addition, the calculations that we have performed on the basis of these reconstructed series give average growth rates of R&D spending of about 14.5 percent per year over the 1949–2015 period. However, it should be observed that the average growth rhythm of these R&D expenditures was much higher in the 1949–78 subperiod than in the 1979–2015 subperiod. The levels of technological advancement of the early years of the People’s Republic are obviously very different than those of today. Moreover, the public research system had to be built from scratch, which partly explains the very rapid growth in R&D expenditure during these first years. However, it must be understood that, at the beginning of the revolution, China’s R&D efforts were far from negligible and must also be analyzed as part of a patient and continuous long-term strategy. In other words, China, whose rate of scientific and technological development compares favorably with the most advanced capitalist industrialized countries, did not start to promote its R&D activities as part of its recent integration into globalization, but well before—in fact, since the victory of the revolution. In recent years, the nature of these research activities has become considerably sophisticated. It was the development strategy of the revolution that set the conditions for the current economic success, and this success has been a continuity of the past rather than a contradiction. While one reads and hears from almost all of Western academia and mainstream media that the Chinese economy’s “takeoff” was due to its openness to globalization, it is useful to add that such growth was made possible only by the efforts and achievements that took place during the Maoist socialist period. Additionally, this new outward orientation can only be considered to have contributed to the country’s economic success if it is clear that it was firmly and effectively controlled by the Chinese authorities. This is because it has been largely submitted to internal objectives and needs as part of its integration into a coherent development strategy—unparalleled in the other countries of the global South. Without such a strategy toward this new orientation, which was an effort of the CCP, opening up to the capitalist world system would inevitably have led to the obliteration or even destruction of the national economy, as was the case in so many other places in the global South. In addition to the social progress and the success of the process of in-depth industrialization, an essential contribution to the extraordinary development of the economy has been China’s emphasis on the agrarian question. China is one of the very few countries in the world to have guaranteed, and to still guarantee, legal access to land for the vast majority of the peasantry. This is unlike any of its Asian neighbors, with the exception of those that led radical agrarian reforms associated with socialist revolution, as in Vietnam. While multiple violations of the law and attempts to limit this access to land have been observed in recent years— particularly the undue surrender of public land by local authorities, followed by family expropriation—peasant resistance has also grown in the face of these numerous abusive cases. The importance of the agrarian question is paramount in the debates both among the Chinese political leadership, as well as in society as a whole. It is impossible to understand the profound changes that occurred in China without placing the peasantry at the heart of one’s analysis. Indeed, the major constraint on China is that of having to feed more than 20 percent of the world population with less than 7 percent of the planet’s arable land. This corresponds to a quarter of a hectare of cultivated land per capita, compared to double that amount in India and one hundred times more in the United States. This huge food challenge could only be raised thanks to the guarantee of access to land for the peasantry, and this remains until now probably the most precious contribution of the Maoist revolutionary heritage. Although market mechanisms have fully penetrated the current modes of organization, production, and distribution of the agricultural sector and have little to do with those of the Maoist era, land ownership still remains state-owned or collective, even if the forms encountered are often degraded, even with private control over some land. However, it is this persistence of public ownership that is a key point in distinguishing the situation and the success of China from other countries of comparable continental size (and so-called emerging economies), such as India and Brazil, or other regionally dominant countries such as South Africa. The conditions in these countries are wholly inadequate for a robust response to the agrarian question. Has China’s strong growth over the last several decades been achieved without difficulties? To answer this, we revisited the NBS database for GDP. In it, we observe that since 1952, the evolution of China’s GDP, expressed at constant prices, appears as an exponential curve. In terms of a logarithmic scale, we see a trajectory situated around a strongly ascending linear trend. There are, however, fluctuations in the GDP growth rates, even if their amplitude tends to decrease over time, and there are four specific periods of negative GDP growth rates. These four periods with negative values amount to seven total years of the sixty-four provided in the sample (1952–2015). This accounts for barely more than 10 percent of the time. These four periods are: (1) 1960–62, corresponding to the rupture of relations with the USSR (−1.3 percent for 1960, −27.8 percent for 1961—by far the largest decline suffered by the country in six decades—and −9.2 percent for 1962); (2) 1967–68, corresponding to the beginning of the Cultural Revolution (−4.4 percent and −2.9 percent); (3) 1976, corresponding to Mao’s death (−2.0 percent); and (4) 1989, corresponding to the Tiananmen Square protests (−4.3 percent). Thus, we can identify, in the context of a clear upward trend in the economic growth rate, four periods of crisis, understood in the traditional meaning of the term as periods characterized by a negative GDP growth rate and a decrease in GDP (expressed at constant prices, that is, excluding inflation). Nevertheless, this approach remains insufficient to account for the difficulties experienced by the Chinese economy during the six long decades since the beginning of the revolution. To deepen the analysis and complexify the concept of crisis, we have chosen to use profit-rate indicators for China. This method of calculating profit rates is customary among Marxist economists to quantitatively study the dynamics of capital accumulation in capitalist countries, but, in general, not in countries that identify as “socialist,” as is the case with China. It is, however, quite possible to use profit rates in socialist economics if their construction and interpretation are clearly distinguished from those of capitalist countries.11 Therefore, we have built several profit-rate indicators in the Chinese industrial sector from 1952 to 2015, based on our series of physical capital stocks. These indicators relate (1) with respect to the numerator, to a surplus or profit, corresponding to the difference between GDP and the various remunerations of workers (whether direct or indirect); and (2) with respect to the denominator, to the capital advanced, consisting of either (a) fixed capital (as we have already defined it), or (b) capital plus a circulating capital estimated on the basis of the speed of rotation of the capital (thanks to inventories). Using a filtering method, we can then proceed to a technical decomposition of the profit rates in long-term trends and short-term cycles. Two observations can be made. The first is that of a downtrend in China’s profit rates over the period between 1952 and 2015, regardless of the chosen indicator. If we now perform an economic decomposition of the profit rates by calculations intended to distinguish the changes in the composition of capital, labor productivity, and the share of profits, we can see that the most decisive phenomenon in explaining the decline in profit rates is the rise in the organic composition of capital (i.e., the ratio between the constant and variable parts of capital). The second observation concerns the short-term cycles that punctuate changes in these profit rates. There is clearly a regular alternation of upward and downward fluctuations, and these cyclical variations decrease between the 1950s and the beginning of the 2000s. However, the magnitude of these cycles tends to reincrease significantly at the very end of the period, that is, from the late 2000s to the present. For the complete sample examined (1952–2015), a regular succession of negative variations in profit rates can be identified. The recession years found for profit rates, marked by negative values in the growth rates in the cyclical components of profit rates, are observed about thirty times over the sixty-four years studied. More precisely, a negative sign is noted for the years 1952, 1957, 1960–63, 1968, 1978–82, 1985–87, 1990–91, 1998–2003, 2009, and 2012–15. Hence, we see that not only are four periods identified (as suggested by the previous brief scrutiny of the trajectory of the GDP growth rate), but ten periods with negative values are recorded, this time for the growth of the profit rate cyclical components, covering a total of almost half of the time sample. Paradoxically, these ten moments of “crises” are most often concurrent with GDP growth, as was the case, for example, in 1963, 1978, 1986, 1991, and 2003. In other words, in the case of China, “growth” does not necessarily mean absence of difficulties and, conversely, “crisis” does not necessarily mean a recession in GDP. In a country like China, which is characterized by powerful contradictions, it seems necessary to use a broader concept of “crisis” in order to account for periods in which structural difficulties arise, even though the appearance of a strong GDP growth suggests that all is going well. An analysis of the long period is crucial for understanding the deep drivers of economic development in China of over sixty years: social progress, industrialization, and the agrarian question. Thus, we examined the strong growth of China’s GDP and industrial profit rates, which we reconstructed from the original series of stocks of China’s physical capital. The changes of these profit rates over a period of more than six decades demonstrate that the economic-growth trajectory of China, exceptional in both strength and scale, has not been smooth. Thus, we have chosen to describe as “crises” the paradoxical periods characterized by both negative variations in profit rates but also positive, and sometimes very high, GDP growth rates. In this line of research, where a lot of work remains to be done, it would be important to shed light on the relationship between profit rates and growth rates, their causalities, and possible changes over time in the impact of their inflections. It would also be similarly significant to study whether rural China has continuously, since 1949, been a buffer for the crises the country has experienced, as well as for the massive transfers the agricultural sector provided to serve the process of industrial capital accumulation to the present day. ↩ See Lau Kin Chi and Huang Ping, eds., China Reflected (Hong Kong: ARENA, 2003). ↩ Angus Maddison, The World Economy: A Millennial Perspective (Paris: Organization for Economic Cooperation and Development, 2001). ↩ Paul Marer, Janos Arvay, John O’Connor, Martin Schrenk, and Daniel Swanson, Historically Planned Economies: A Guide to the Data (Washington, DC: World Bank, 1992). ↩ Development Indicators (Washington, DC: World Bank, various years), databank.worldbank.org. ↩ China Statistical Yearbook (Beijing: National Bureau of Statistics of China, various years), http://stats.gov.cn/english. ↩ Zhiming Long and Rémy Herrera, “Building Original Series of Physical Capital Stocks for China’s Economy Methodological Problems, Proposals for Solutions and a New Database,” China Economic Review 40, no. 9: 2016, 33–53; Penn World Tables (Groningen, Netherlands: Groningen Growth Development Centre of the University of Groningen), http://rug.nl; Gregory C. Chow, “Capital Formation and Economic Growth in China,” Quarterly Journal of Economics 108, no. 3: 1993, 809–42. 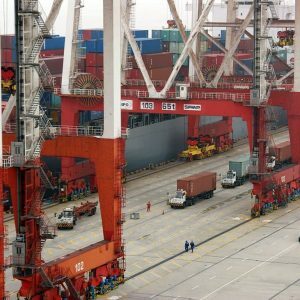 ↩ Zhiming Long and Rémy Herrera, “Una Contribución a la Explicación del Crecimiento Económico en China: Nuevas Series Temporales y Pruebas Econométricas de Varios Modelos,” Cuadernos de Economía—Spanish Journal of Economics and Finance 41, no. 115: 2018, 1–18. ↩ As an example, the Barro-Lee Educational Attainment Dataset is of high quality, but only starts from 1970 and is recorded in five-year periods, which is far from sufficient for the requirements of our economic analysis (http://barrolee.com). Meanwhile, the statistical data disseminated by the Penn World Tables undervalues the educational levels of the Chinese population. ↩ Paul Marer, Janos Arvay, John O’Connor, Martin Schrenk, and Daniel Swanson, Historically Planned Economies , 52. ↩ Paul Marer, Janos Arvay, John O’Connor, Martin Schrenk, and Daniel Swanson, Historically Planned Economies , 50–51. ↩ Zhiming Long and Rémy Herrera, “Capital Accumulation, Profit Rates and Cycles in China from 1952 to 2014: Lessons from the Evolution of Chinese Industry,” Journal of Innovation Economics & Management 23: 2017, 59–82. ↩ Wen Tiejun, “San-Nong” Issues and Institutional Transformation (Beijing: China Economic Press, 2009). See also Wen Tiejun, Handbook on Economic Crises in China: Ten Lessons from China, 1949–2015 , forthcoming. ↩ Zhiming Long and Rémy Herrera, “Elementos de Reflexión Sobre el Crecimiento Económico de China en el Largo Plazo: 1952–2014,” Temas de Economía Mundial, Nueva Época II, no. 32: 2017, 63–81.